At night, the darkness of the prison was complete. It draped itself across the stone walls, and seeped into the prisoners’ ragged clothes, an inky stain that did not wash out completely in what pale daylight managed to penetrate the prison’s interior through the narrow shafts high in the walls. When the wind stopped outside, the still darkness had weight under which many prisoners cracked. “We’re in here,” Kytheon had countered. “You’re in here because you make a poor thief, who was caught for stealing rotten vegetables and a handful of coins. I’m in here for brawling. We’re not killers. So just watch out is all I’m saying.” Drasus had shrugged as though nothing could be done. Drasus was three years older than Kytheon, and hot-tempered. He’d been taken to prison more than a season prior, and seeing him was a welcome reunion, though Kytheon hadn’t liked what he had seen in that shrug. He’d tried a different approach. “You say that now, but he’s bigger than the thugs on the outside. I’m telling you, he’s king.” At that, Drasus had walked away before Kytheon could argue. There were always people trying to muscle their way into the Foreigners’ Quarter to set up their networks of thievery, smuggling, and intimidation—brutes like Anthedes of the Bloodied Axe, or connivers like Krevarios the Venomous. Kytheon could recognize a bully—he’d spent most of his life dealing with them in some form—and he couldn’t wait to meet Ristos. At dawn, the new prisoners were bound together by lengths of iron chain and marched through labyrinthine corridors of rough-hewn stone. Kytheon counted six other prisoners, two of whom looked like they’d been through this before. A guard opened a heavy wooden door and the prisoners were led into a cavernous chamber where scores of native prisoners appeared to be laboring. The air in the chamber was stale, like Kytheon’s cell, but unlike his cell, it was tinged with the scent of mildew. In the center of the chamber, a round shaft, twenty feet across, was cut into the floor. A matching shaft disappeared into the ceiling, and between them, a dozen cables carried huge barrels in both directions. “Welcome to the Waterfall of Akros,” bellowed a crooked-backed guard, “where the water flows up.” He laughed at his own joke, one that Kytheon did not understand but had a feeling he soon would. The other guards corralled Kytheon and the new prisoners to an enormous six-spoked crank that was being driven by prisoners who stood six abreast at each spoke, turning it in great circles around a massive oak axle. “First group! Take a rest!” a guard said. The prisoners pushing one of the crank’s spokes peeled off, massaging their aching muscles or wiping the sweat that burned their eyes. Kytheon felt a shove at his back, and he took his position at the crank beside the other new prisoners. The wooden beam felt smooth beneath his hands, where countless hands had pushed against the constant resistance of endless barrels of water being hoisted from the river in the valley below to the polis of Akros perched on the cliff above. This was what prison meant. Labor and captivity. He was to be a beast of burden. It was not unlike Akroan hoplite training, Kytheon reflected, smiling to himself. Making the body like marble, they called it—a daily regimen of running and hauling heavy objects. But that was when he was to be a soldier. When he was a kid. That was before he was expelled from the army, before he was an Irregular, before he was a thief, and before he was a prisoner. His shoulders and calves burned as he worked the crank. He tried to keep the pain at bay by focusing on a single barrel, following its journey from when it appeared out of the floor until it disappeared into the ceiling. He wasn’t counting them, just watching them, willing himself to follow just one more, and one more after that. There was always another one. In the gap between two ascending barrels, Kytheon observed a handful of prisoners repairing damaged barrels. They were at work, hammering new iron rings into place with wooden mallets. These prisoners looked healthier, filled out—well fed. Kytheon didn’t remember hearing the other groups get called, but who was he to argue. Legs wobbling without the wooden beam for support, he made his way to a corner of the chamber where bits of masonry were strewn about as makeshift chairs. Old and broken prisoners filled cracked clay cups with water from a barrel, offering them to the prisoners from the first group along with a heel of stale bread. Meager food was nothing new to Kytheon. The Foreigners’ Quarter of Akros was not known for its opulence or abundance, and there were many days that he, Drasus, Little Olexo, Epikos, and Zenon had to content themselves with such meals. When he bit into the hard bread, the texture of granulated crumbs was familiar. He found a chunk of masonry and slumped against it. Its cold surface was a welcome relief that he meant to compliment with a mouthful of water. He lifted his cup to his lips, and tipped the water into his mouth, letting the cold liquid slosh around. “Tribute!” said a rasping voice that interrupted Kytheon’s moment of contentment. The voice belonged to a stout man, barely taller than Kytheon was, who walked among the gathered prisoners of the first group. Kytheon watched as all of the prisoners the man walked by dropped half their bread, without protest, into a sack he held out to them. Kytheon swallowed the water he had been savoring. Ristos? The man came closer. He was bare from the waist up, his torso covered in thick, dark hair, save for the scattered raw streaks of puffed scars. “Tribute!” the man said again, stopping in front of Kytheon. The man didn’t answer. Kytheon looked past him to where the barrels were being repaired. A large man, broad at the shoulders, met the young prisoner’s stare with his own. He had a face wreathed in a mane of coal-grey hair. “You should be,” the thug said through gritted teeth. 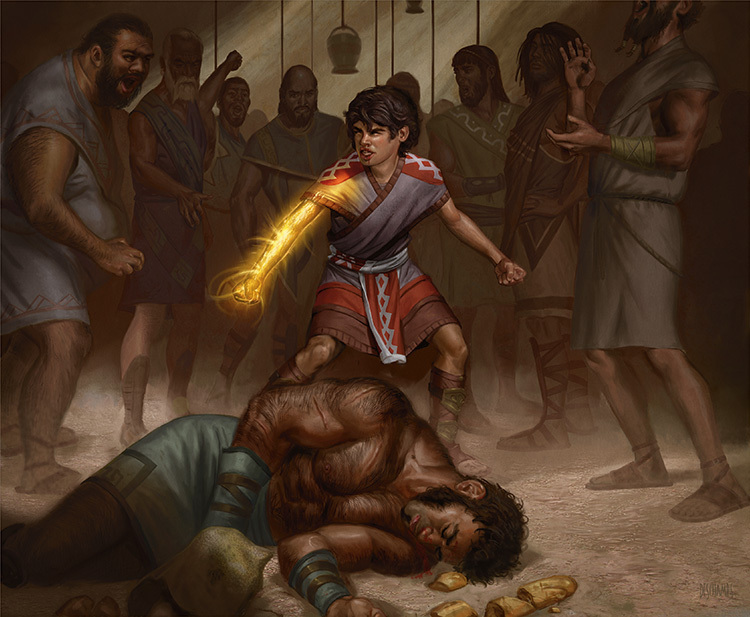 He tossed his sack of extorted bread aside, but before it hit the ground, Kytheon shoved himself off the chunk of stone and drove his foot into the other man’s shin. There was a roar of agony as the thug reeled back. In an instant, Kytheon was on his feet, launching a flurry of jabs at the other man’s face. He danced out of range of the counterattack, forcing the thug to overextend and expose himself to another barrage of fists. Kytheon smiled. A surge of energy welled in him, and he forgot about his sore muscles and grumbling belly. This was his element—the fight. Ristos’s thug was a seasoned brawler, Kytheon could tell from his experience scrapping with Drasus. This guy was sack of meat who could take a hit, but he was predictable and, like all of the thugs Kytheon had fought in the alleyways of Akros, this one was a talker. “I’m going to drink wine outta your skull!” he threatened. Another haymaker, followed by another of Kytheon’s dodges, and another sequence of his punches that connected with ribs and jaw. 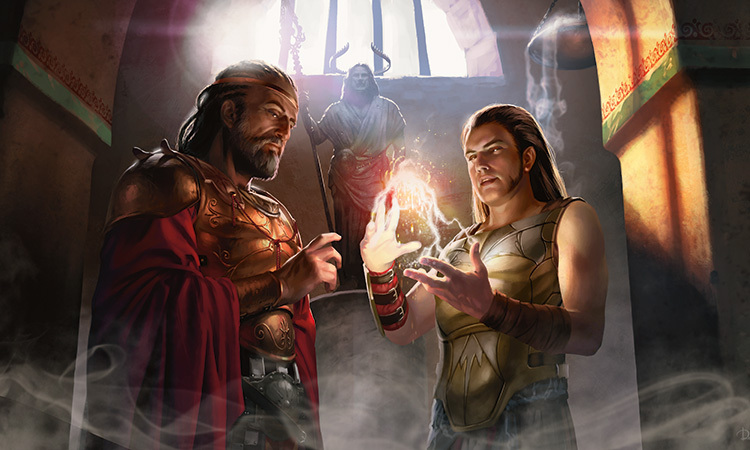 Keep babbling, Kytheon thought as he circled around his opponent. For Kytheon, fighting was reflexive—intuitive, instinctive. As a child, he discovered that it was also the source of his magic. The other prisoners watched them fight, but made no moves to intervene. Kytheon stole a moment to scan the gathered prisoners for Ristos, who he saw had moved in closer and was still watching. Then all at once, the edge of Kytheon’s vision exploded. He’d underestimated the thug’s speed. He found himself on the ground, looking up at the other man who was already on top of him, raining down punches. The first few connected. One caught Kytheon on the nose with a sickening crunch and caused another explosion in his vision. He had to regroup. He had to focus. 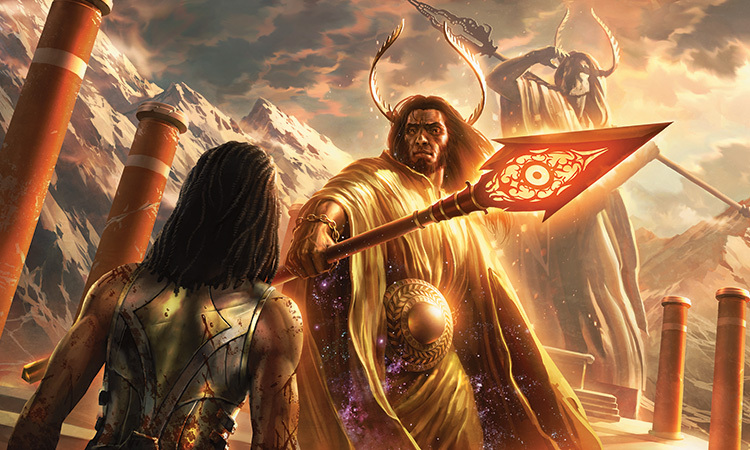 The man’s fist rose, but before it fell again, the surface of Kytheon’s skin flared up with countless bands of light that rippled with energy. The fist came down. When it struck Kytheon below the eye, he felt no pain. Instead he was filled with a burst of energy that he threw into a punch of his own, connecting with the man’s jaw, which cracked under the force. The action was punctuated by the man’s yelp as he tumbled off of Kytheon. The boy rose to his feet, bands of light still rippling across his body. The chamber was silent except for the moaning of the thug who lay in a heap cradling his splintered jaw. Blood ran from Kytheon’s nose, down his chin, and onto his rough-spun garb. He spat a glob of red onto the stone, reached into the abandoned sack of bread, and withdrew a piece. All eyes were on him, but Kytheon just stared at Ristos and proceeded to tear off a chunk of bread with his teeth. 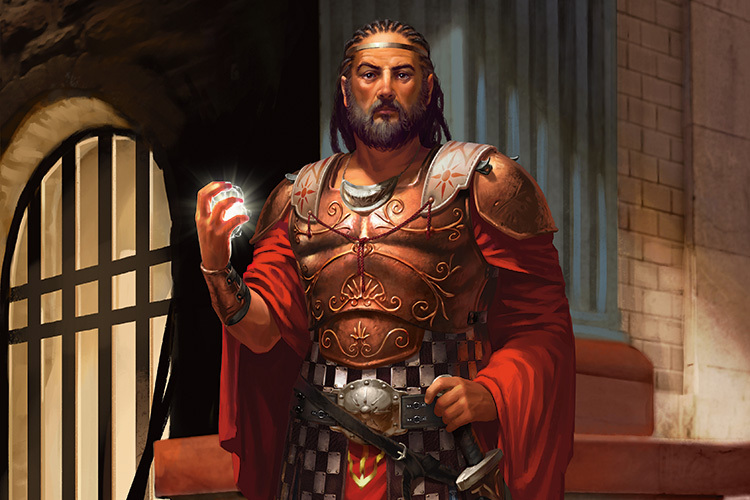 Ristos made a motion, and half a dozen prisoners emerged from the rest, surrounding Kytheon. The boy wiped the blood from his mouth with the back of his hand, smearing it across his cheek. He looked each of Ristos’s thugs in the eye, turned back to their boss, and grinned. 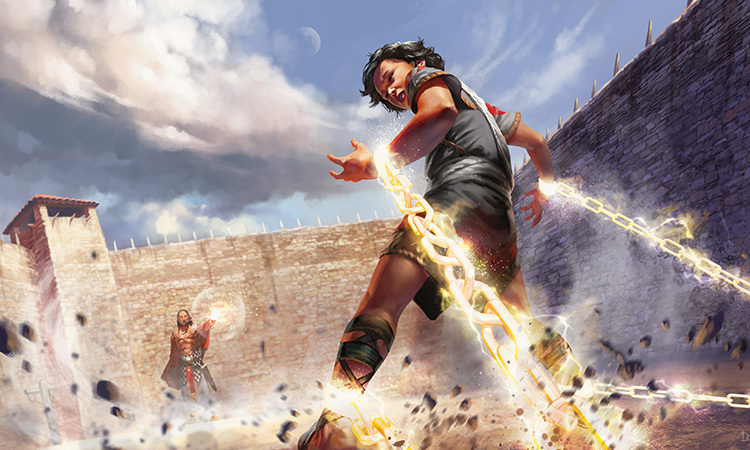 It wasn’t long before guards pushed their way through the throngs of prisoners, but Kytheon didn’t need long. By the time the guards arrived, they found Kytheon, bloody-faced and bloody-fisted, pummeling the last of Ristos’s men. When the thirteen-year-old kid saw the guards descending on him, he slumped to the floor, spent, exhausted, and utterly satisfied. Kytheon stood before the warden, bound in iron at the wrists, a pleased smile stretched across his face. Hixus waved his hand, and the two guards who had escorted the young prisoner turned and left Kytheon and the warden alone. To Kytheon’s ears, it sounded like a list of accomplishments. With a movement so quick that it startled Kytheon, Hixus took the heavy ring of keys that hung from his belt, and dropped them on the table. Iron clattered on wood, and before the sound faded, Hixus had a dagger in his hand. Kytheon took a step back, raised his fists defensively, and light erupted over his body in frenetic ripples. Kytheon hesitated only for a moment. His fingers closed around the hilt. Pride swelled in Kytheon. He always liked to fight. He was good at it. Kytheon pointed the dagger at the warden for a long moment. Neither averted his gaze from the other. “I’m not going to kill you,” Kytheon finally said. He dropped his arm to his side, letting the dagger clatter to the floor. Though Kytheon hadn’t agreed to the training, his protest has been largely ignored. He was roused before the sun the next morning and dragged out to the prison’s modest gymnasium. It was a round patch of packed earth surrounded by high walls. Hixus was standing in the center of the arena-like circle. He tossed his ring of keys to the dirt. “I’m still not going to kill you,” Kytheon said. Hours later, Kytheon lamented, he had gained no ground. Each of his charges were abbreviated by chains of brilliant white energy that erupted from the ground to shackle his limbs, or by lashes of luminescent magic that pushed his limbs just enough to interrupt his gait and send him tumbling to the dirt. There could be no progress. The keys were infinitely far from his grasp, and with each fruitless exertion, they edged even farther away. Then without a word, Hixus scooped up the keys and left the gymnasium. Kytheon dropped to his knees in the dirt, frustrated and full of spite. The days that followed unfolded much like the first: Hixus offered the keys, Kytheon attempted to retrieve them, but failed, Hixus left with the keys, and Kytheon seethed at the cruel game. One gray morning after a punishing storm, Kytheon struggled to rise from the muddy mire that had become the gymnasium ground for what felt like the hundredth time. When his strength failed, he collapsed back into the muck. The warden stood over Kytheon, looking down at the boy who returned his gaze with eyes that were filling with tears and contempt. “It’s not me! It’s you! You won’t let me even get close,” said Kytheon. Half a dozen escape attempts later, Kytheon took to his training. It complimented his natural talent for reading others in combat, intuiting their position and body language to understand what they would do next. 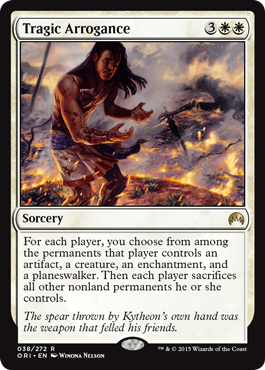 Hieromancy gave Kytheon a tool to disrupt opponents and press his advantage. 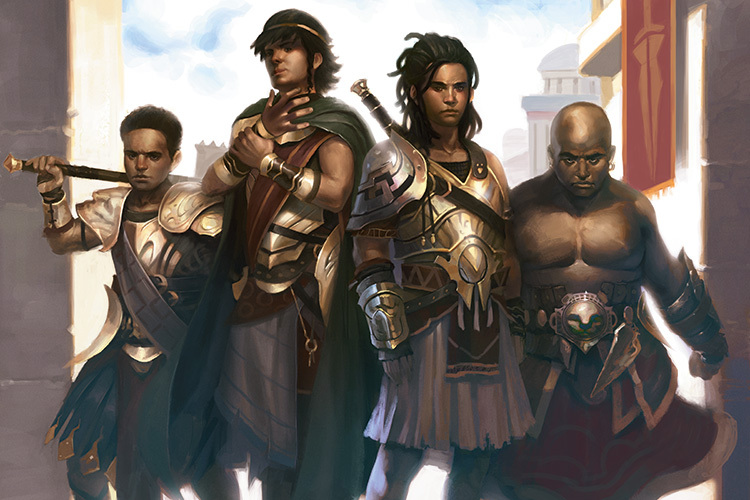 Every morning, Kytheon the student was awakened before dawn to join Hixus in the gymnasium, and every afternoon, the irons that bound his wrists were replaced and Kytheon the prisoner rejoined the others at the Waterfall of Akros. He benefited from both activities. Hieromancy strengthened his mind, and turning the great crank strengthened his body. He fell into a rhythm and for four years he relied on the structure to carry him through his days. Until one morning his rhythm was interrupted. Kytheon’s eyes flew open at the piercing sound of a shrill shriek. He bolted up, alert. It was later than usual, he could tell. Where were the guards? More shrieks sounded, gathering together as a rising, terrible chorus. Harpies. He didn’t know how he knew, but he did know. Though he had never encountered one, Kytheon knew them from stories—winged horrors that feasted on the dead and carried off children. He sprang to his feet and strained to look out his window. The harpies were approaching from up river. Their relentless shrieks were answered by the deep clanging of bells, calling soldiers to their posts on the walls of the Kolophon, the mighty Akroan fortress. The panicked scrambling above meant that no stratian or oromai rider arrived with warning. Kytheon watched through his narrow slit of a window as the horde descended on the fortress like flies on a ripe corpse. The harpies were endless, and he couldn’t shift his gaze from the black cloud of feathers and talons and hunger. Through the terrible noise, Kytheon heard a pounding at his cell door. He saw Hixus’s face in the door’s barred window. “The polis is under attack,” said Hixus. The bolt in the door clicked, and the door swung open. The warden filled the doorframe. He had donned his full armor—his bronze-plated breastplate, matching greaves, and metal-crested helm. He gripped his unsheathed sword in one hand and held a rough sack slung over his shoulder in the other. “Do you want to earn your freedom?” said Hixus, tossing the sack at Kytheon’s feet. Kytheon raised an eyebrow. He knelt and reached into the sack, and when he withdrew his hand, it was wrapped around the hilt of a sheathed Akroan sword. The other contents completed the armaments of a hoplite: breastplate, greaves, and round shield. Kytheon grinned. A short while later, Kytheon found himself, armed and armored, in the prison’s cavernous waterworks, among a little under half of the prisoners. Warden Hixus stood atop a chunk of masonry and addressed the gathered criminals. 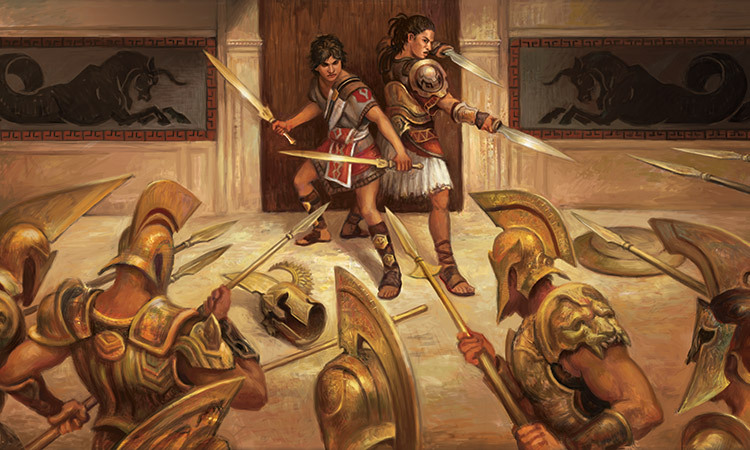 Kytheon and Hixus sprinted from the Archway of Champions to the bright sands of the arena at the head of the militia of prisoners. At their approach, harpies scattered into the air from the corpses of the Akroan guards upon which they feasted before wheeling around to attack what they saw as fresh meat. The winged creatures wheeled above the polis, a swirling, ravenous mass…then fell upon the prisoners. Prisoners scattered, fending off what they could. A harpy dived into Kytheon, who had only enough time to lift his shield to deflect its weight. The harpy grabbed hold of the rim of the shield with its talons, but Kytheon leaned into it, managing to pin the monster beneath the shield. Its dark eyes made it seem almost human until it parted its leathery lips to reveal pointed teeth meant for piercing human flesh. The harpy shrieked, trying to wriggle free, but fell silent when Kytheon thrust his sword into its neck. Another harpy crashed into Kytheon’s back before he could withdraw his blade. Talons sunk deep into the muscle of his left arm. Kytheon gritted his teeth and dropped his weight to his right to roll away from the new attacker, bringing his shield around to catch the harpy in its ribs, forcing it to retreat. He braced for a counterattack. 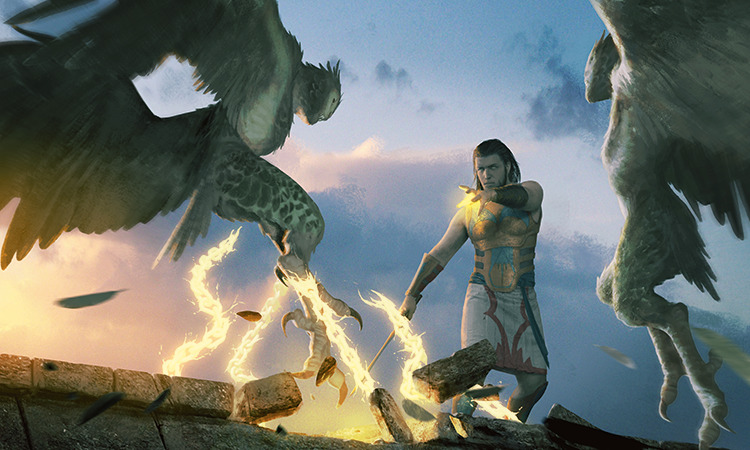 The harpy circled Kytheon and crouched low, using its arms as support. Kytheon circled with it. The harpy stood upright, lifted its black-feathered wings, and screeched. With a downward stroke of its wings, the harpy leapt into the air to avoid the attack while another harpy barreled into Kytheon. Harpy and Akroan tumbled to the sand of the arena. More harpies descended on Kytheon, vultures converging to pick his bones clean. Filed teeth slid into the flesh of his upper arm. Kytheon yelled out in pain, but the yell turned into a roar. He wrapped both arms around the harpy gnawing at his flesh, and pinned it to him. Using it as a shield against the others, he rolled free. He cast the harpy aside and scrambled to his feet. He had bought himself a moment. Before the harpy could find its feet, Kytheon summoned forth from the ground a set of brilliant white chains to bind the monster. More enemies swarmed from all directions. Everything around him was a blur of black feathers, and all sound was drowned out by the shrill screeches of the harpies. A sudden burst of white energy erupted in the sky above the arena, sending out waves in concentric rings. It passed through the mass of harpies. They began to fly erratically, colliding with one another. Hixus. 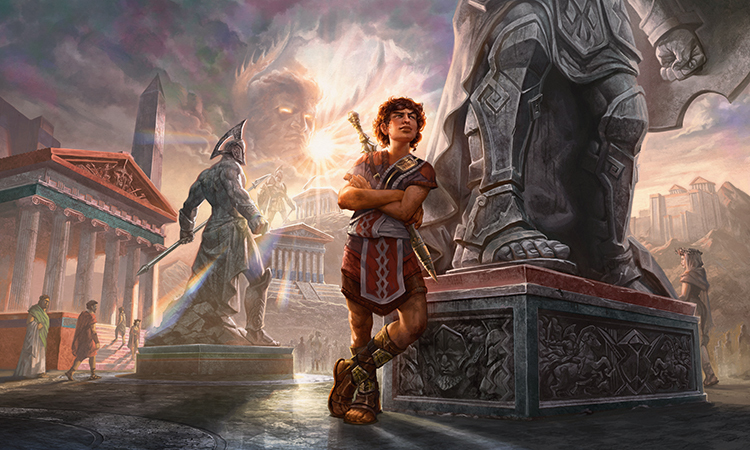 Kytheon found his mentor on the steps at the base of Iroas’s column in the center of the arena. His eyes glowed an intense white as he channeled energy into the sky. Where the disoriented harpies crashed to the sand, Kytheon called forth glowing, white chains to bind them. Kytheon scooped up his sword and bolted for Hixus, where the surviving prisoners were already ranking up in a ring around the column. They locked their shields, with swords and spears jutting out. They became a single entity, a phalanx in the Temple of Triumph, standing against a host of enemies. Many harpies fell, and more turned away. Kytheon raised his sword in salute. “Hoplites of the Broken Chains!” he declared, and was answered with a collective, rising roar. The respite faded as quickly as it had begun. “Cyclops!” came a cry from the wall of the Kolophon. “And another!” called a second voice. Above the arena, the harpies were regrouping. Scores flew off for the walls in search of easier prey. Kytheon felt the weight of Hixus’s gaze. He met it, expecting a lesson, even in the middle of all this, but his mentor simply nodded. A moment later, Kytheon was making his way along the top of the wall that surrounded the polis. Harpies passed him by as they converged on the Temple of Triumph. When he turned to follow their course, he saw a bright, white helix reaching skyward. Glowing pulses surged up the winding, parallel strands, and Kytheon understood. The harpies were drawn toward the source, and they converged once again on the Temple of Triumph. He didn’t know how long the warden and the others would be able to hold out, but if they didn’t buy him enough time to deal with the cyclopes, the polis would be lost. He ran flat out, passing sporadic clumps of soldiers battling cyclopes. Each blow against the walls reverberated throughout the polis, echoing of marble and stone. Finally, he arrived at the Foreigners’ Quarter, where the old wall turned inward, marking the polis’s original boundaries. The wall had been extended to include the Foreigners’ Quarter, but it was neither as tall, nor as formidable here. 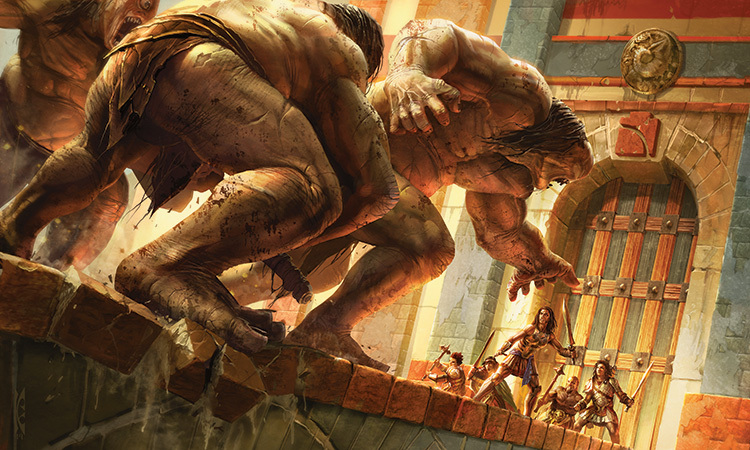 From where he stood, he could see three of the lumbering cyclopes barreling toward the wall. Left alone, they would bring it down. From the old wall, Kytheon dropped down onto Stone Pike, a raised walkway built into the wall that allowed quick access around the Quarter. As he ran, he was greeted by the familiar pungent odors of the Quarter. Below him were familiar streets he knew and loved, streets that he hadn’t seen since he was pulled from them by Akroan guards. He had been gone for four years. He had been gone when the attack came. But now he was here. He was home. 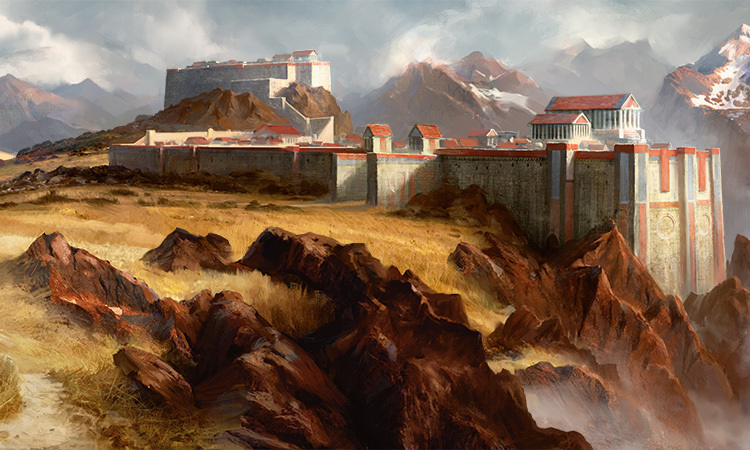 Kytheon followed Stone Pike to the Quarter’s fortified gatehouse, the point at which non-Akroans first entered the polis. As he approached, he saw a man directing people who carried enormous beams meant to reinforce the gate. Kytheon laughed out loud. He knew the man, an Irregular named Zenon, a Setessan who always insisted on placing wagers on any form of contest. His hair had grown shaggy, but he wore the same green cloak he’d brought from the woodland polis years ago when he first came to Akros. Kytheon called down to his friend. “I didn’t believe it when they told me the prisoners were released,” said Zenon. Kytheon climbed down to the street to help bear one of the beams. The wall behind them boomed then groaned as a cyclops threw its weight into it. “It’s going to come down!” shouted Zenon. “What?” Zenon gave him a look. “Trust me,” Kytheon said, running toward the gate. He understood Zenon’s hesitation; only a few years ago his face would have held the same baffled expression, or more likely he would have charged at the straining wall without so much as a thought. But, this was not a few years ago. Adapt, turn the situation to my advantage, ensure victory. Kytheon confidently threw his weight into one of the beams that was holding the gate shut. The great wooden gates moaned as their hinges gave to the power of the cranks that drove them. The sound did not go unnoticed. As Kytheon hoped, the cyclopes diverted their attention to the opening in the wall, and they rushed toward it. Kytheon and a handful of the Irregulars marched through the gateway and on to the causeway. “Seal it!” called Drasus to the soldiers at the gatehouse. The first cyclops came charging down the causeway as the gates began to creak closed. It was a thing of raw anger and unrelenting hunger, its single eye fixed on the gate behind the Irregulars. It had a disproportionately large mouth that frothed as it ran, sending globules of foamy saliva in all directions. This was a mouth that could swallow a person whole. Before Kytheon could rejoin his comrades, the second cyclops was upon him. Zenon the Setessan tossed his spear to Kytheon, who caught it in time to sidestep out of the cyclops’s reach. Kytheon whirled, planted his feet, and drove the spear into the side of the brute’s leg. The spear’s tip tore through muscle before emerging out the other side. The cyclops tried to swat at Kytheon. It took a step to pivot. As it brought its other leg around, it caught the shaft of the spear, and it went crashing to its knees. Kytheon dragged his sword across its throat. Kytheon watched the sun break over the tops of the mountains that rose above Akros. He stopped climbing for a moment to let the sunlight wash over his face. “Well, today we are the first,” said Kytheon, closing his eyes and filling his lungs with crisp air. “Well-earned, I’d say. Look.” Drasus pointed to the causeway in front of the polis’s main gate where he counted more than twenty Akroans tugging at ropes tied to the lifeless corpse of a cyclops that they were hauling away. Two other cyclopes lay lifeless on the causeway. The two Irregulars turned to resume climbing the mountain. They scanned the surrounding area for another wave of monsters, for any sign that the attack wasn’t over. Farther up their ascent, Kytheon and Drasus parted ways. Drasus was to scout to the north, while Kytheon took the south. For more than an hour, Kytheon picked his away along a crumbling stone footpath that took him higher up the mountainside. He was not an experienced climber, but he relied on his reflexes to keep his footing. The path took him to the edge of a deep gorge that dropped to a river that wound out of the mountains toward Akros. Spanning the gorge was a bridge of rock that somehow seemed both natural and shaped all at once. Kytheon’s gaze followed the length of the bridge. The other side was bathed in daylight despite the shadows that still shrouded the surrounding rocks. To his surprise, a man greeted him on the other side. The man had a powerful frame that was draped in flowing, gold fabric. Thick, black hair fell past his shoulders, and above his head floated a laurel of golden leaves. The spear he held was tipped in brilliant golden filigree that surrounded a luminous orb. Behind the man rose an immense marble statue so brilliantly illuminated that Kytheon was unable to make out its features. The man lowered the tip of his spear to the ground and the shift in light brought out the detail of the statue, which Kytheon recognized as a marble replica of the man. “God of the Sun,” boomed Heliod. At this, Kytheon bowed his head. The Sun God reached out and put his hand upon Kytheon’s shoulder. “You proved your worth as a warrior in the attack on your polis, but it is time to prove yourself worthy to be my champion.” He reached up to the sunlit sky, and the light coalesced around his fist. It elongated and took the shape of a spear that resembled the god’s own weapon. Kytheon gaped, both at the spear and at the task the god had set before him. Kytheon was sprinting. Beneath his feet, the cracked, barren earth flew past. His chest heaved and his lungs burned, but his legs continued pumping. If Kytheon had his way, his legs would carry him to the low hill ahead, where a windblown, crumbling formation of rocks stood. And there he would not be alone. Heavy footfalls, one for every half-dozen of his, shook the ground behind him, kicking up clouds of dust. 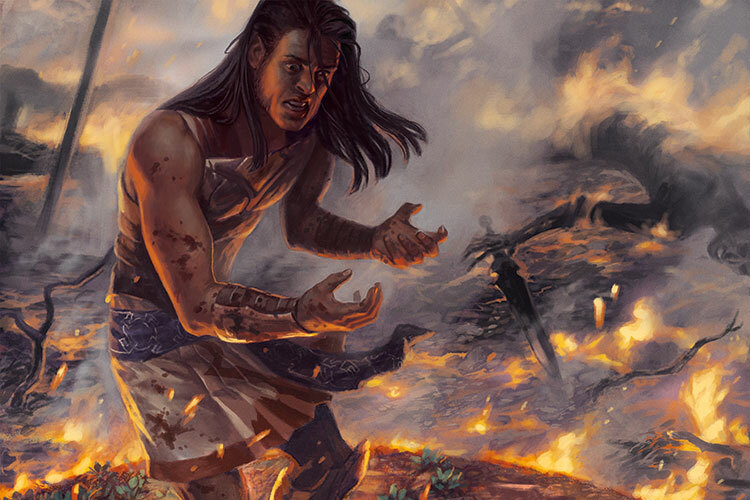 Killing a titan was no easy task, but Kytheon had clearly made an impression on Erebos’s servant. Kytheon glanced at the sticky, black blood that clung to the tip of his sun-touched spear, and risked a look over his shoulder. His vision was filled by the titan’s frame. 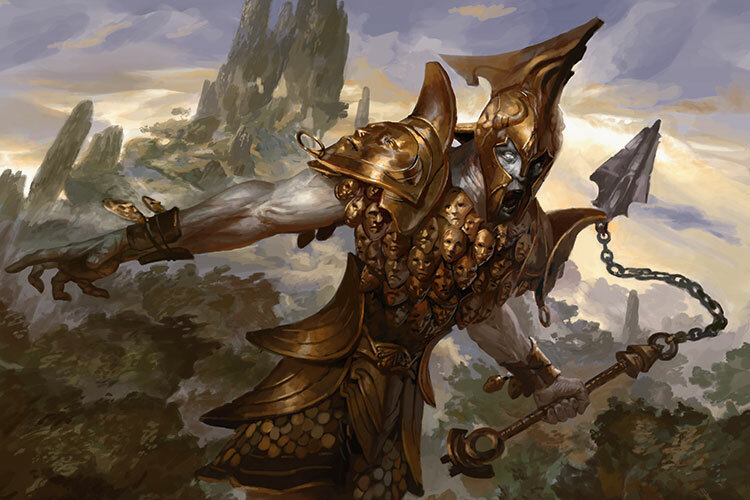 The titan was clad in scale armor fashioned from scores of golden masks from those who escaped the Underworld. At that moment the vacant eyes of each mask seemed to be staring right at Kytheon. A shadow streaked overhead. Kytheon saw the head of the titan’s massive flail falling like a meteor toward him. He rolled away as it slammed into the ground beside him. When Kytheon reached the rocks, he kept running. As he passed through two crumbling pillars, the titan’s flail pulverized one to his left. It exploded in a hail of stone shards. Kytheon tumbled to the ground. The back of his head felt warm, and when he touched it, his hand came away smeared with blood. Careless, Kytheon thought. Should have seen that coming. The clank of chain told Kytheon that the titan was gathering its flail for another swing. He had to keep moving. The titan let out a low, rumbling roar, and the stench of mold and rot billowed from its mouth. Winded, Kytheon gulped the foul air, and though it seemed to cling to the inside of his mouth, it was enough for him to scramble away from the titan’s attempt to stomp the would-be champion of Heliod to pulp. The titan lashed out with a backhand. Kytheon anticipated it. He caught the blow, unscathed and unmoved, his protective magic absorbing the impact. He grabbed hold of one of the titan’s colossal fingers, planted his feet, and refused to let go. He just needed a moment. Three Irregulars emerged from hiding to join Drasus. They had ropes that ended in crude grappling hooks. Just another bully in the Quarter, thought Kytheon, smiling amidst the chaos. Olexo, the youngest among them, cast his rope over the titan’s thick forearm, and the hook sank into pallid flesh. The others followed his lead, and when the titan broke free of Kytheon’s hold, the Irregulars yanked on their ropes. The titan wobbled off balance. Enraged, it whirled its flail around its head, clearly eager to be rid of such annoyances. Every action has a response. The idea filled Kytheon’s mind. Every action has a tipping point that, if recognized, can be harnessed as magic to gain control of a fight. He saw his opening. Kytheon rolled off the fallen titan. The Ordeal is done, he thought. Heliod’s task is fulfilled. Akros is safe. He reclaimed his spear, and turned to the Irregulars. Here they were, a bunch of kids from the Foreigners’ Quarter. 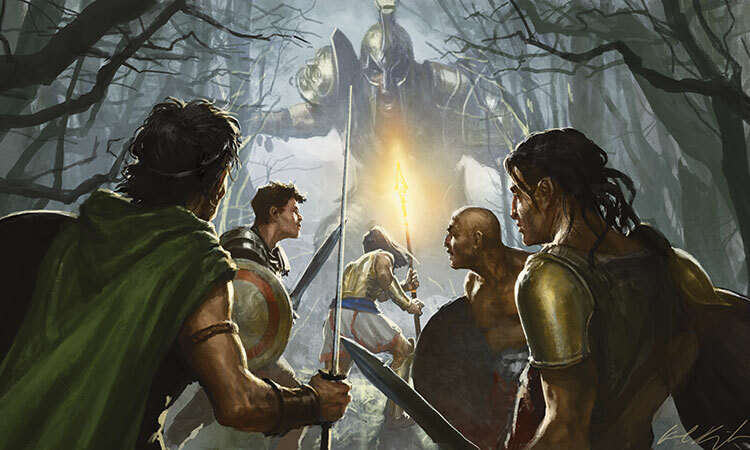 Together, they had broken the stranglehold of crime lords in the Quarter, defended Akros from hordes of ravening monsters, and destroyed a titan in service of a god on behalf of another god. They were his comrades, his family, and his terms for accepting the Sun God’s Ordeal. Alone, he was strong and skilled. But together with his Irregulars, what were the squabbles of the gods? In his peripheral vision, Kytheon saw the horizon move. When he looked, he saw two wisps of smoke rising into the sky, their source a pair of dark eyes. Erebos, God of the Dead, loomed over the landscape, a witness to the defeat of his servant. Inky, black vapor rose from the god’s dark eyes that were set in his emotionless face. Kytheon drew his spear back. He was the champion of Heliod, the Sun God. If Erebos was the cause of all of this trouble, then he would have to answer for it. Kytheon let the spear fly. He felt its power as he let it loose, and the spear sailed through the air toward the God of the Dead. Emotionless, Erebos gave a simple flick of an emaciated wrist. From the horizon, his whip unfurled, appearing to take on a life of its own. When it met the champion’s spear in flight, Erebos flicked his wrist a second time. The whip cracked, deflecting the spear back toward Kytheon at blinding speed. Kytheon stood defiantly against the counterattack and the Irregulars fell in around him. Striations of light flickered to life on his skin, and he summoned all the magic and strength that he could as he watched the tip of the weapon close in. When the spear slammed against him, it exploded in a flash of intense light that washed over Kytheon, turning everything white. The light lingered for a while, and when it died down, it took a moment for Kytheon’s eyes to adjust. His ears rang, and he found it difficult to focus. Color slowly seeped back into his surroundings. He looked down, inspecting where the spear made contact. No damage, but he noticed flecks of red. He moved a hand to wipe them, and saw that the back of it was splattered red too—both hands were. But if it wasn’t his blood…. His eyes passed over four lifeless bodies. The ground heaved, and Kytheon struggled to keep his footing. He staggered among his fallen Irregulars, mouth agape. His thoughts turned to the spear, thrown by his own hand. With clenched fists, Kytheon began to shake. His magic exploded to life once more, and bands of light moved faster and faster over his body. His skin threw off arcs of light that rippled from him with increasing intensity. The sky above him spun. As white light continued to pour off of him, the landscape around him began to shift, bend, and stretch. From it, rolling plains emerged. And the twilit sky gave way to a vibrant blue. Nothing made sense anymore; it felt like the whole world was coming to an end. Eyes red and face twisted in anguish, Kytheon tilted his gaze skyward, where a brilliant sun shone. He closed his eyes and knelt there unable to will himself from that spot. Time passed. Kytheon had no way to gauge how much. A continuous, dull ache numbed his insides. The hairs on the back of his neck stood up. I’m being watched, he thought. Erebos? Heliod? Fine. Let them. Then he felt a blast of warm air accompanied by a low, rumbling growl. His eyes flew open and an enormous, shadowy mass, silhouetted against the sun, filled his vision. His pupils adjusted to the light. Kytheon stumbled backward at the revelation, throwing his arms up defensively. The lion made no movement, and after a moment, Kytheon lowered his arms. 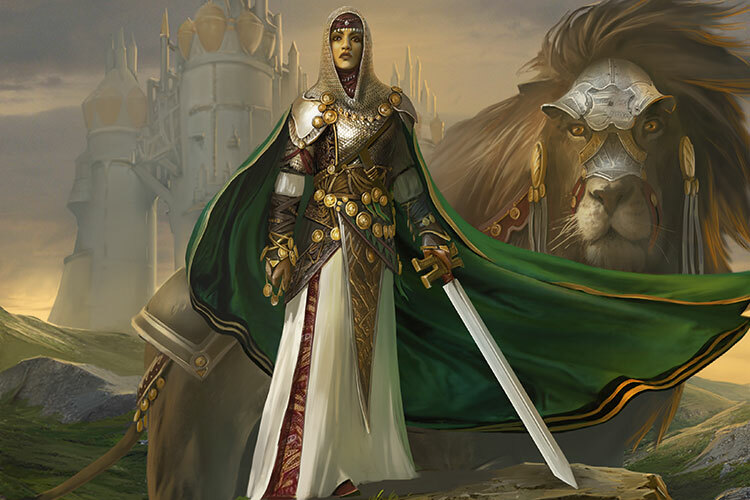 He saw that the lion was barded like a warhorse, and atop a saddle sat a rider encased in armor like none Kytheon had ever seen. It covered the rider from head to toe, and where it caught the sun it gave off a brilliant gleam. 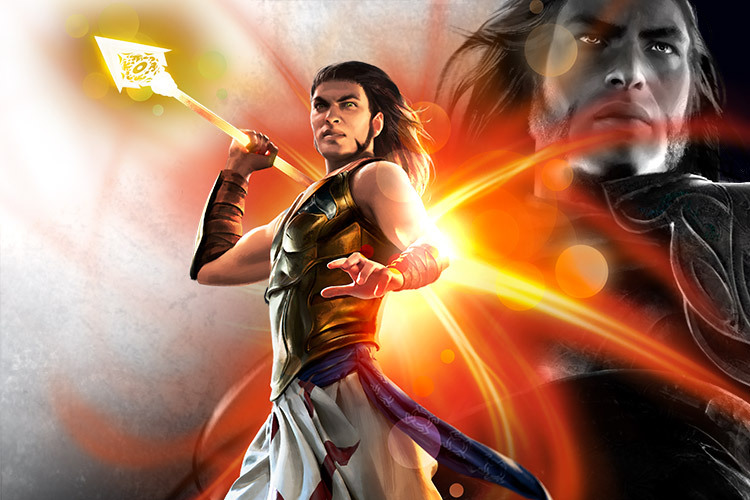 “Gideon?” Moukir attempted to confirm. Before he could correct the knight, Kytheon was overcome by a wave of serenity that suddenly welled up inside of him. His eyes were drawn skyward. Beyond the knights he saw a woman descending from the air, held aloft on two wings of white feathers. There was a sense of nobility about her that was calming and inspiring all at once. She came to hover before him, an angel clad in plate armor like the knights. 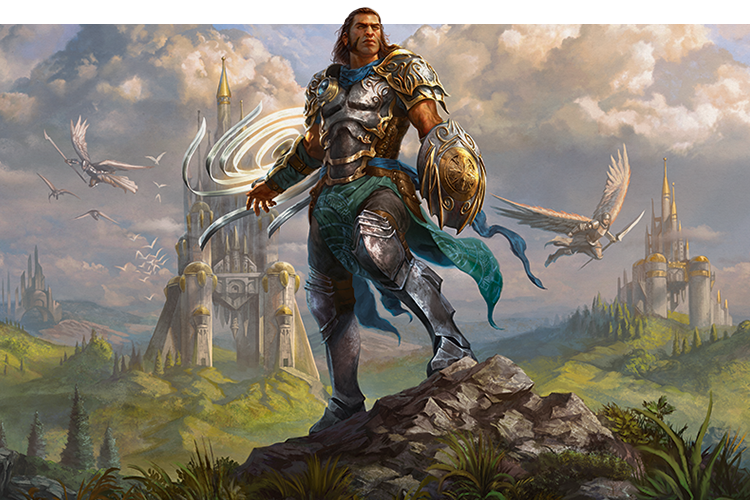 In that moment, Kytheon knew that he had left Theros, his home, behind. His Irregulars were gone—a pain he brought with him. His ordeal had only begun.